This is my favourite way to eat salmon fillets - especially when I remember to let them marinate overnight and let the flavour soak right in, leaving the most tender, flaky and flavoursome salmon that you will ever try. The marinade is really simple to make, using basic ingredients that you probably have sitting in your cupboard already. 1. In a small bowl, combine 1 tablespoon of soy sauce, 1 tablespoon of the honey and the garlic. 2. Place the salmon fillets in a food bag and pour the soy marinade on top. Seal and store the salmon in the fridge overnight or for several hours to allow the salmon to soak up the flavours. 3. Preheat the oven to 180°C/ 350°F/ gas mark 4. Cut the aubergine in half lengthways and lightly score each half with a knife in a criss-cross pattern. Place the halves on a sheet of tinfoil on a baking tray. 4. Combine the olive oil and the remaining soy sauce and honey in a small bowl, and pour the mixture on top of the aubergine. 5. Bake in the oven for 25 minutes. Spoon any marinade in the base of the tray on top of the aubergine and sprinkle the salad onion on top, before placing the tray back in the oven for another 10-15 minutes. Place the salmon fillets on a sheet of tinfoil on a baking tray and bake in the oven alongside the aubergine and salad onion. 6. Sauté the tenderstem broccoli in the coconut oil and lemon juice in a hot frying pan for 5-8 minutes. Toss in the edamame beans and fry for another 2 minutes. Sprinkle with coriander and season with salt and pepper to taste. 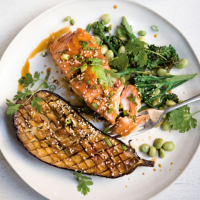 Recipe taken from The Food Medic: Recipes + Fitness for a Healthier, Happier You by Dr Hazel Wallace. Yellow Kite, 2017. This recipe was first published in Wed Jun 07 10:42:49 BST 2017.